Here at Prime Stables, we love horses and we especially enjoy hearing stores about horses who have helped change the face of history as we know it. Which is why, I decided to put together this article on famous war horses’ as horses were utilised in battle throughout history for generations and, without them, little would have been achieved. We have used horses in warfare throughout history in many different forms. Throughout history, mules, donkeys and horses played a crucial role in providing support to armies in the field. There were many sizes of horse that were used in war, depending on the form of warfare. The type used to vary depending on the role the horse was required to play during warfare. 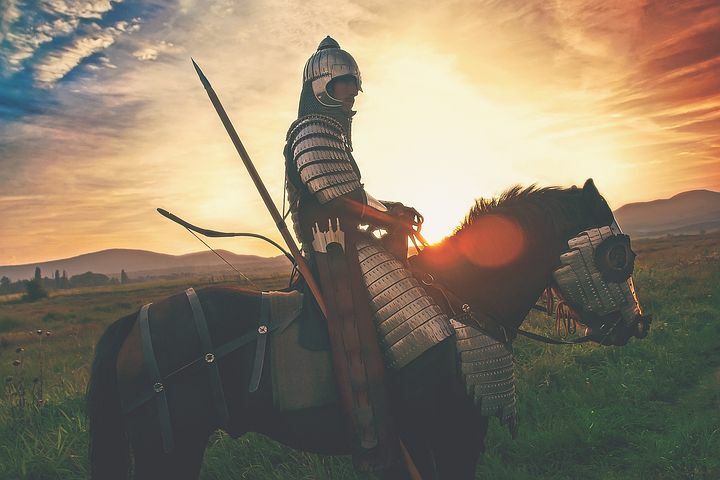 The effectiveness of horses in battle was revolutionised by improvements in technology, including the invention of the saddle, the stirrup, the horse collar and the halter. It wasn’t until after World War I that horse cavalry began to be phased out in favour of tank warfare – although a few horse cavalry units were still employed during World War II. By the end of World War II, horses were seldom seen in battle, but were still used extensively for the transport of troops and supplies. That being said, let’s look at some of the most famous war horses’. Bucephalus – yes, that really was his name! – was the favourite horse of Alexander the Great and was believed to be with Alexander from when he was 12 or 13 years old. Alexander the Great won the horse in a bet with his father after successfully taming him. He named him Bucephalus because it meant ‘Ox-head’ and came from a mark that had been branded onto the horse. This stunning horse was especially strong and have one beautiful blue eye. Alexander and Bucephalus rode in numerous battles together and it seemed they were inseparable. As a result of his many victories in battle, Bucephalus became one of the most famous horses in classical culture, standing alongside such famous mythical beasts such as Pegasus and the wooden Trojan horse. Sadly, Bucephalus passed away but people are unsure of the cause. Some suggest he died of wound battles, while others say there are historical indications that suggest he died of old age. Whatever the cause, Bucephalus has been forever remembered and Alexander even founded a city in his memory. Marengo was born in 1793 and became the steed of the First Consul and later Emperor of France, Napoleon Bonaparte. Marengo was a small grey Arabian stallion that was known for being steady and brave in battles – characteristics that were highly-valued in a war horse. Marengo carried the Emperor in numerous battles and was injured a total of eight times during his military service. During the Russian campaign of 1812, Marengo fled during a Russian raid and survived the retreat from Moscow, unlike many unfortunate soldiers who sadly lost their lives. Marengo was captured during the Battle of Waterloo and sold to a captain in the British Grenadier Guards. After Marengo died, his skeleton was put on display and can still be seen in the National Army Museum in Chelsea. Copenhagen was the battle charge of the Duke of Wellington and was exceptionally fast. Born in 1808, Copenhagen was a mixture of Arabian and Thoroughbred parentage. He began life as a race horse, coming third in every race he won. This compact and muscular horse and extremely powerful and certainly an excellent companion for the Duke of Wellington in numerous fearful battles. Wellington continued riding Copenhagen for ceremonies and parades, after the Napoleonic Wars, until Copenhagen’s retirement to the Duke’s estate at Stratfield Save where he lived out the rest of his days relaxed and pampered. It was in 1836 that Copenhagen sadly passed away at 28 years of age. He reportedly died from consuming too many sweet treats but many people think his death was mostly due to his advanced age. He was buried very early in the morning and the day after his burial, the Duke of Wellington hosted full military honours in the Ice-House Paddock at the Duke’s country residence, Stratfield Save House. Traveller was born in 1857 and was a beautiful American Saddlebred with iron grey hair and a long mane and tail. He was bought by General Robert E. Lee in February 1862 and was renamed from Greenbrier to Traveller. Lee rode Traveller during many battles during the American Civil War. During the Second Battle of Bull Run, Lee was holding Traveller by the bridle when the horse spooked and pulled Lee down onto a stump. Both of Lee’s hands were broke and he had to travel in an ambulance. Lee passed away before his horse and during his funeral procession in 1870, Traveller followed the casket. A year later, Traveller stepped on a nail and developed tetanus. Unfortunately, this wonderful horse had to be shot to put him out of his suffering but he will always be remembered for the work he did. Palamo was known for being a particularly beautiful horse. Tall and white, with a tail that almost touched the ground, Palomo stood out drastically from all other horses. Palomo was owned by Simón Bolívar who had been given the horse by an elderly peasant woman just before the Battle of Boyacá. Sadly, after years of service, Palomo died of exhaustion while on a campaign. He was buried next to a hacienda chapel where he lies peacefully to this day. These famous war horses are so inspiring. Who knows, perhaps your horse will do something extraordinary in his lifetime or perhaps he already has! Let us know in the comments below if your horse has done anything extraordinary!